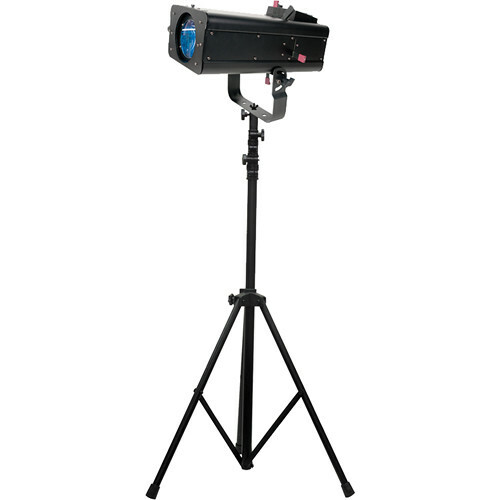 The FSL101 System from American DJ comprises the FS600LED followspot and the LTS-6 tripod stand, and is an ideal solution for mobile DJs and entertainers who need to quickly position their light wherever it is needed most, in clubs, theaters, event spaces, and more. The FS600LED from American DJ is a powerful followspot designed to project bright beams of color and white light in theaters, clubs, and similar locations. Combining traditional spotlight functionality with the benefits of LED technology, the FS600LED features a fan-cooled, 60W high-powered white LED which draws only 80W of power, allowing it to stay cool and to provide a longer lifespan than with traditional bulbs. It is capable of throwing spot beams in eight different colors (white, warm white, red, blue, green, orange, yellow, and UV). The fixture includes a manually adjustable iris, focus, framing shutters, and an 18 to 26° beam angle. Color selection, LED strobe effect, and 0-100% electronic dimming can be controlled via on-board sliders or via three DMX channels, letting you integrate the unit into your existing lighting setup. The FS600LED comes equipped with a gobo and a gel frame holder, a hanging bracket, and a universal auto-sensing power supply. The 9' American DJ LTS-6 Tripod Stand with T-Bar is a black stand with a single T-bar for mounting par cans, lighting fixtures, lighting effects, and other accessories. It collapses for easy transport, and weighs 11 lbs (5kg). Mounting hardware is included. Box Dimensions (LxWxH) 22.0 x 14.0 x 13.25"
Box Dimensions (LxWxH) 44.5 x 5.0 x 4.0"
FSL101 System with FS600 LED Followspot and LTS-6 Tripod Stand is rated 5.0 out of 5 by 1. Rated 5 out of 5 by Anonymous from Great buy for the price This item is great for a small yo medium setting. It has its own fader. I didn't need to connect to a light controller and it's also light enough to travel with if necessary. The color buttons are my favorite. It's easy to use. What bulb does this fixture use? mine is quiet, sort of a hard question to answer as your opinion of quiet may be different than mine.